Thank you for writing this wonderful article, "Study links Gulf War vets' illnesses to area of service," on this important research study. Perhaps you might consider a follow-up story about the Senate's inexplicable actions last week to eliminate funding for the DoD program that funded this study (details in the forwarded email, below). Until recently, VA and DOD wasted over $300 million on so-called GWI research with essentially nothing to show for it -- certainly no treatments or anything else to improve the health and lives of the 200,000+ ill Gulf War veterans. However, with the relatively new Congressionally Directed Medical Research Program (CDMRP) for Gulf War Illness treatment-focused research, there have been significant and groundbreaking findings like this one, and like the discovery that Coenzyme Q10 is effective in relieving some GWI symptoms. The follow-up story could focus on these exciting successes, which are now at risk after last week's Senate appropriations committee vote that would entirely eliminate this CDMRP Gulf War Illness program -- the only federal government program or funding that has, to date, provided anything of use to ill Gulf War veterans like me and so many others. My apologies for being out of touch the last few days, I have been on the road and just now had a chance to go through the Senate Report to the FY12 Defense Appropriations Act. As you probably already know, on September 15, the Senate Committee on Appropriations approved the FY12 bill by a vote of 30-0. The Senate included in its version of the bill $1.018 billion for RDT&E in the Defense Health Program. This is below the level approved by the House in its version of the Defense bill: $1.187 billion (the table in the Senate report states that the “House allowance” for this line item is $1.217 billion – not sure why there is a discrepancy). However, it is slightly above the amount that the Senate included in their initial mark last year for the FY11 bill: $1.011 billion. As in previous years, the Senate report includes specific diseases and disorders eligible for funding out of the “Peer Review” program (p. 227). BOTTOM LINE: I think given the amount of cuts that the Senate had to absorb, this could have been a lot worse. If the House and Senate choose to meet half way, it could mean a small reduction below the numbers included by the House for the specific CDMRPs. We should do all we can to preserve the House numbers in conference! Also, we shouldn’t keep our guard down with respect to possible amendments when this comes to the floor of the Senate. I have yet to hear of any rumblings from Senator McCain or others, but we need to be prepared in case amendments are offered! WASHINGTON — New research to be released Monday shows that veterans with Gulf War illness faced different toxins depending on where they were served: anti-nerve-agent pills and Scud missiles for forward-deployed troops and pesticides for support personnel in the rear. 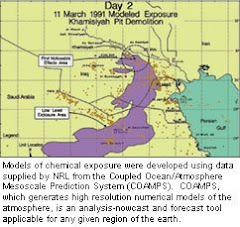 There’s also no correlation between anthrax shots, depleted uranium and psychological issues and Gulf War illness, said the study by the Midwest Research Institute to appear in the Environmental Health Perspectives journal. That supports earlier research on those topics. Steele and her co-authors surveyed 144 veterans with Gulf War illness and 160 Gulf War veterans with no symptoms. But rather than ask them if they were exposed to depleted uranium or anthrax shots, which many troops did not know, they asked about their experiences: Did you receive an injection in the buttocks in theater? Did you have contact with destroyed enemy vehicles? Were you directly involved in ground combat? Nerve agents, anti-nerve agents and insecticides come from the same chemical family and, therefore, affect the body in similar ways, Steele said. That’s why people may have the same symptoms for different exposures, Steele said. But she said the research also does not discount other possible toxins, such as oil fires or fine particulate matter from dust storms. “We could have solved this a long time ago if there were a smoking gun for a single issue,” she said. 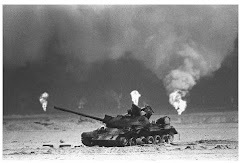 They found Gulf War illness was most prevalent in the veterans who served in Iraq or Kuwait — or the combat zones — who took pyridostigmine bromide pills, which were small doses of nerve agent meant to help troops build up a resistance in case of a chemical attack. However, those troops did not report using pesticides on their clothing or skin. These service members also reported being within one mile of an exploding Scud missile. In support areas, such as on a ship or in Saudi Arabia, Gulf War illness was most prevalent in personnel who used pesticides on their uniforms or skin, the researchers found. Army veterans have suffered from Gulf War illness at higher rates than those from other services, Steele said. However, troops from other services who said they also took the nerve agent bills also report Gulf War illness at similar rates to soldiers, she said. Insecticides used in rear areas are only considered potential causes. Only Army support troops used a 70 percent DEET insecticide and lindane powder, which is no longer used in the Army. Insecticides now contain only 30 percent DEET. DEET contains the same chemical that causes problems in nerve agents, but the Environmental Protection Agency has determined it’s safe as long as it’s used as directed by civilian manufacturers. Soldiers also used the insecticide permethrin on their clothing. It’s designed to last through six months’ worth of washings, but the researchers found that improperly trained soldiers applied the solution once a week or even, in some cases, daily. Steele said there are more published studies due by the end of the year that investigate potential causes and treatment. One treatment includes the successful use of fibromyalgia medication. “I’d say there’s hope on the horizon,” Steele said. "There’s also no correlation between anthrax shots"
REALLY......then why did some vets come down with GWI even though they were not deployed In Theater? The simple answer to the question is that the common link is the vaccinations they received before deployment because they were most likely to go due to their career field.